How Well Do You Understand Options Pricing And Options Strategies? If you fully agree with all of the just-mentioned statements, you clearly have a very good understanding of options pricing and options strategies. But don’t worry if you didn’t fully agree with all of these statements. 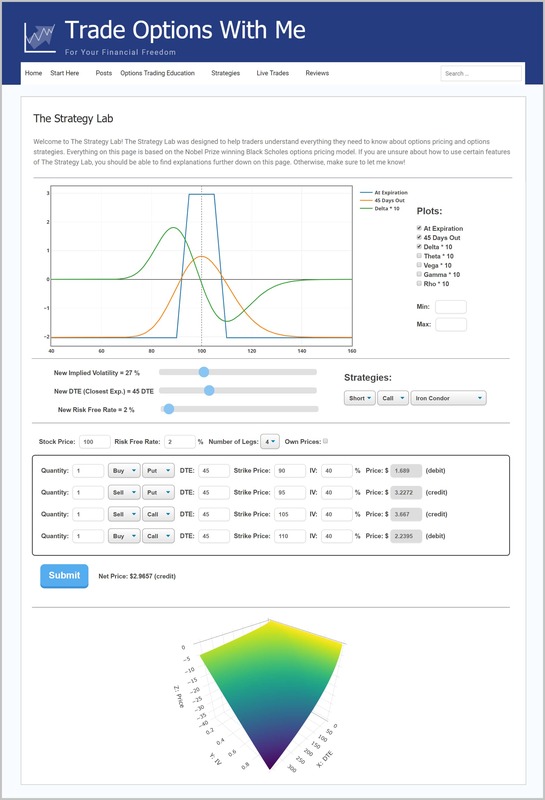 I have created a tool that will help you develop a much better understanding of options pricing, options strategies and much more. I call it The Strategy Lab. Everything in the Strategy Lab is based on the Black Scholes Model – a mathematical model that won a Nobel Prize in Economics. The model was developed by Fischer Black, Robert Merton, and Myron Scholes and is still one of the most commonly used derivative pricing models. The best way to learn options is not by reading articles on them. The best way is to try out as much as possible without risking your hard-earned money. That’s exactly what The Strategy Lab allows you to do. The Strategy Lab allows you to visually learn all the intricacies of the rather complicated Black Scholes options pricing model. Furthermore, it allows you to directly see how changes in market conditions can and will impact your trades. Summed up, The Strategy Lab is the research tool for option strategists. How much does The Strategy Lab cost? The final price of The Strategy Lab will be a one-time payment of $50. However, if you are reading this, you still have the chance to gain lifetime access to The Strategy Lab (including future updates) for a one-time payment of $29. That’s over 40% less than the final price! Let me present you an example of how The Strategy Lab could be used to analyze the commonly used option strategy: short iron condor. At Expiration (blue): This shows the payoff of this iron condor at its expiration date. X Days Out (orange): This plot shows the payoff of this iron condor X days before expiration. Delta * 10 (green): This plot shows the Delta of this short iron condor multiplied by 10. Theta * 10 (red): This plot shows the Theta of this iron condor multiplied by 10. Theoretically, it would also be possible to display the plots of all the other Greeks at once. However, then it would be hard to recognize what is going on. The blue ‘At Expiration’ plot looks just like you would imagine the payoff diagram of a short iron condor. It achieves max profit if the price of the underlying stays between the two short strikes (95 and 105). The max profit of this iron condor is $351.4. Max loss, on the other hand, will occur when the underlying’s price is either below the 90 long strike or above the 110 short strike at expiration. The max loss is $149. When changing the time until expiration, the blue ‘At Expiration’ plot is not affected because there always are 0 days left for this plot. Next up, let’s discuss the orange ‘X Days Out’ plot. As seen with this plot, time clearly has an impact on the payoff behavior of the iron condor! The impact that the passing of time has depends on where the underlying asset’s price is. If the underlying asset’s price is in between or near the two short strikes, the impact of passing time is positive. Otherwise, the opposite is the case. This means, as long as there still is sufficient time left until expiration, an iron condor can still be profitable even if the underlying’s price moves slightly above the upper or below the lower short strike price. Now let me present, what the Delta plot shows you. Delta is the option Greek that measures the effect that a $1 increase in the underlying’s price has on the option’s price. While the price of the underlying asset is 100, the Delta of this iron condor is 0. This makes sense as this iron condor is a neutral strategy and wants the underlying’s price to stay inside of a certain range. That’s also why the Delta becomes positive if the underlying’s price drops and negative if the underlying’s price rises. If the underlying asset’s price drops, the iron condor becomes more and more bullish and the opposite is the case for increases in the underlying’s price. With less and less time until expiration, the Delta of this iron condor right around the long strikes becomes more and more extreme. This means with less and less time, this iron condor becomes more sensitive to changes in the underlying’s price. So a small move in the price of the underlying can have a much larger impact on this iron condor when it has little time left than if it would have many days until expiration. That is one of the multiple reasons why it is a good idea to take profits early on iron condor trades. The longer you wait, the more volatile the profit and loss of the iron condor becomes. Last but not least, let us talk about the Theta of this iron condor. Theta is the option Greek that measures changes in an option’s price for changes in time. In other words, Theta is the amount that an option’s price will change for the passing of one day. As you can see on the animation, the Theta of this iron condor seems to be pretty flat while there still is a lot of time left until expiration. However, as time passes, Theta seems to awaken. This means that for every day that goes by, this iron condor will change more in price than it did the day before. The increasing sensitivity to changes in time is not linear. The closer the iron condor gets to its expiration date, the more its payoff will be impacted by changes in time. Furthermore, it is evident that the Theta is positive while the stock price is in between the two short strikes. This indicates that time will have a positive effect on this iron condor’s payoff while the stock price is between the two short strikes and negative if is elsewhere. The closer the iron condor gets to its expiration date, the narrower the range in which time has a positive effect becomes. Now we covered all the plots shown on the animation above. Hopefully, my relatively basic analysis of this iron condor could give you some insights into how to potentially use The Strategy Lab. Obviously, this only just scratched the surface of The Strategy Lab’s analysis capabilities. I only analyzed the effect of time on four plots on one chart of one variation of one option strategy. In addition to this, you could also analyze all the other Greeks, the effect of changes in implied volatility, the effect of changes in the risk free rate, the ‘IV, time and price relationship chart’ and much more for hundreds, thousands or even more different strategies and their variations. The Strategy Lab allows every trader, regardless of skill level, to significantly improve their understanding of options strategies, options pricing and the dynamics of options in the markets. These are things you need to know to become a successful (options) trader! If you have any questions, comments, feature requests or anything, make sure to let me know in the comment section below. I will do my best to help you out as soon as possible. Previous Previous post: Do This for 1 Minute After Every Trade and Transform Your Trading! Trading is not something that I am familiar with and. The reason I have not yet traded myself is because I have felt quite intimidated by all the things that go into it and the fact that there is a risk involved. My husband has traded on and off over the years and I am sure that this is a tool he would love to try out. He has made some nice side income from trading. This tool is just $29 once off and it looks like it has so much to offer. I’m going to tell my husband about it – thanks for the information. Thanks a lot for your comment. I hope your husband will enjoy The Strategy Lab and learn a lot from it. Louis, I have just gotten into trading field within the past 2 months, so I still consider myself very Green. To my surprise, I actually am familiar with the Black Scholes Model, as my best friend (who is a trader full time) tried to teach me about it, so I find the fact that the Strategy Lab is based off of it quite interesting! I would like to run this program by my friend and see what she says. However, I’m only a beginner and even I can see the usefulness of a research tool for option strategists. I really do aspire to improve my understanding of options strategies and thereby increase my profitability as a trader in the making. I feel as there’s a lot of potential here, so thank you for those post! Thanks a lot for your comment. I am glad to hear that you see the potential of The Strategy Lab. I hope it will be of great use to you. I am trying to learn trading as it is a great way to earn money.So,in this regard i was looking for a proper guideline. After reading this article i have found the perfect guideline for me in this purpose.I believe this is a great tool for me to start learning about options trading.The price of this tool is $29 once off and it looks like it has so much to offer which has impressed me the most. I will share this great article with my friends and relatives so that they can benefited from this. I am happy to hear that you enjoyed this article. I’ve really enjoyed reading this article as you’ve provided us with lots of valuable information on this trading analysis platform called The Strategy Lab. I’m very interested in starting with this. $50 seems like a very fair price to me. Thanks a lot for taking your time in writing this blog. Well Done! I’ve actually been looking for some help finding a proper option trading strategy analysis platform, and this looks like it might be something that can be of some serious help! Thank-you for writing this very in debt article full of imagery and great content that was very helpful! I hope the best for your website in the future! Thanks for this article. I really enjoyed reading it. The Strategy Lab seems like a very great tool for me to learn more about options strategies and pricing. In my opinion, $50 is a very good deal for it because that is the size of a normal trade profit for me. I am looking forward to using this new tool. Hi Louis, your website is a treasure of great ideas, I for the most part I have avoided the stock market and it show these days. It seems I am going to have to send more time learning all of this. I’m impressed with your thoroughness and the4 scope of your learnings. Sometimes it feels overwhelming to learn all of this, so I’m wondering if you have any posts for very beginners – baby steps? Thanks for taking the time to comment. I have many articles for beginners. I recommend starting with my free options trading beginner course. Thanks for sharing your thoughts about The Strategy Lab. I have been paper trading far OTM Credit Spreads with excelent results and am ready to go on with real time trading. However, finding good candidates has not been easy and I would like to find a good Service that could help me. Any idea? I personally use tastyworks for all my trading. In my opinion, they are one of the best brokers for (options) traders. If you want to learn more about tastyworks, I recommend checking out my review of tastyworks.